Online backup service; free for personal use. Is there a better alternative to CrashPlan? Is CrashPlan really the best app in Backup category? Will CrashPlan work good on macOS 10.13.4? 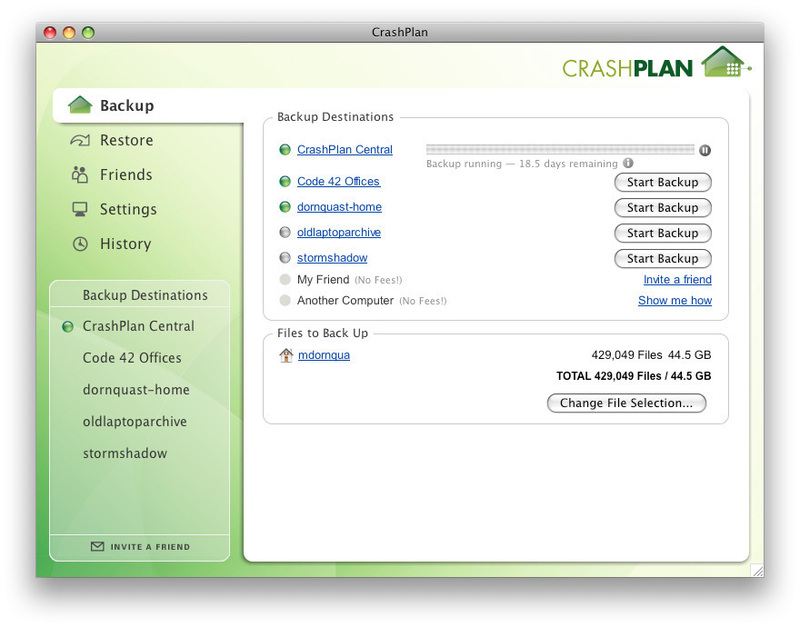 CrashPlan offers local and online backup that's automatic, secure, and cross-platform. Even if you need to back up as many as 10 computers at home, CrashPlan delivers multi-destination protection that maximizes convenience, flexibility, and rapid restores. It's free to back up locally and to friends and family, and it's just a few dollars a month for unlimited online personal backup with a CrashPlan subscription. CrashPlan runs on Mac, Windows, and Linux. Corrects an issue in which text was missing from the bottom of the Restore screen on Mac devices using macOS High Sierra 10.13. This fix introduces minor changes to the restore interface for all devices. Corrects an issue on Mac devices using macOS High Sierra 10.13 in which the CrashPlan menu bar app closed unexpectedly under certain circumstances. Note: CrashPlan is available in both free and paid versions. Individual, Family, and Business subscriptions are available, and their pricing schedules can be found here. Corrects an issue on Mac devices using macOS High Sierra 10.13 in which some text was missing from the status messages at the top of the CrashPlan app.